Dhoop Kinare meaning at the edge of the sunshine in Urdu was a Pakistani television serial presented by the PTV network. The show centers around a team of doctors in a hospital in Karachi and revolves around their routines at the hospital and private lives at home. The show starred Rahat Kazmi and Marina Khan in lead roles, was directed by Sahira Kazmi and written by Haseena Moin. In the early days of PTV, drama serials were usually applauded for being richly diverse in their plots and direction. They were celebrated not just in Pakistan but their quality content was cherished over the border in India as well. A long list of such dramas may usually include Dhoop Kinare as one of those at the top. The drama serial enjoyed seemingly undeniable success for two further decades after it finished airing on television. This serial is usually said to have promoted the careers of both Rahat Kazmi and Marina Khan as one of the most sought after stars in Pakistani television industry. Recently in October 2011, Hindi adaption of this show was launched by Sony TV as "Kuch Toh Log Kahenge". Original DHOOP KINARE DVD released by MAX Entertainment comes in 1 disk DVD pack. While processing the order, we bubble wrap the DVD in its original packing and send it in sealed plastic or carton pack. We don't offer download of the Tvserial DHOOP KINARE, nor we send free poster of the Tvserial along with its DVD order. We also don't offer free wallpaper or song download of the Tvserial. Poster and other accessories of the Tvserial can be purchased separately. Buy Urdu DVD DHOOP KINARE and watch them at the comfort Of your own home. 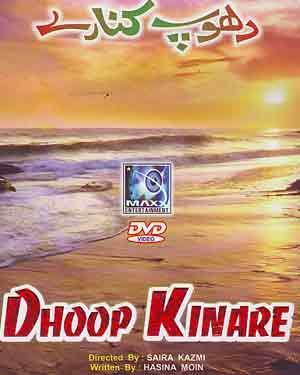 Online shopping DHOOP KINARE DVD, Buy DHOOP KINARE DVD, purchase original Urdu DVD of DHOOP KINARE. Online store to buy DHOOP KINARE DVD	, online DVD store india, buy Urdu DVD, watch Urdu movie DHOOP KINARE videos online. We don't offer DVD renting for Urdu movies online, Buy Original DHOOP KINARE DVD @ discounted and cheapest price online in India.